So, what are YOU doing the weekend of August 11th? Yes, this August 11th. Next weekend. Whatever it is, stop right now. 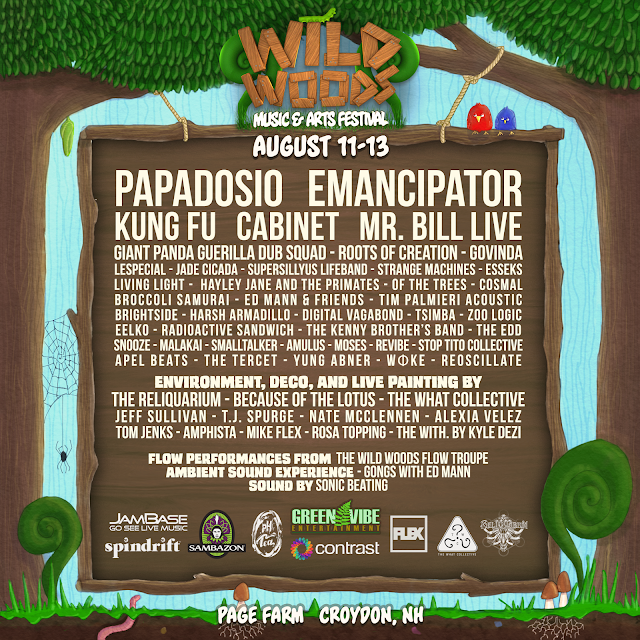 Cancel those plans immediately, and head over to WILDWOODSFEST.COM to get your tickets and plan your weekend in lovely Croydon, NH for the annual Wild Woods Music and Arts Festival. A Perfect Mess will be on hand to cover the festival, and this is one you do not want to miss this year. If I hear someone say the phrase "get down", I immediately think of Kung Fu. They have an incredible song called The Get Down with a chorus that says "I'm about to get down..." over and over. It's singable. It's addicting. This is ringing in my head right now thinking about Wild Woods. I DO feel like I am about to get down. A lot. Not only will we be seeing more Kung Fu (which if you haven't by now, you need to - there is no one like them doing what they do and they will knock your socks off - you can read more about them here) but we also have an INCREDIBLE lineup in addition to look forward to. Another favorite, Giant Panda Guerilla Dub Squad, who I have written about a few times and praised probably to an annoying degree...(sorry guys) will be there as well. You can't have enough Giant Panda. Papadosio who I have not yet seen live but have REALLY been getting into lately, will be playing Friday night and I am super stoked for that. Ed Mann and Friends, which I can't really explain my excitement to see (former percussionist for Zappa - what?!) There are a ton of super amazing bands this year. Cabinet, Emancipator, Roots of Creation, lespecial, Brightside, Strange Machines, Govinda, really I could just fill this post with the artists on the festival. There is a ton, and the lineup is stellar. I am really excited to be getting up there to check this out. A Perfect Mess is relatively new to festival coverage, so I have not yet experienced Wild Woods, but I did some back reading and it looks like we are in for a treat with the festival that these folks put together. Past lineups have all been impressive so this is not a small time festival. This is run by a team that knows how to throw down and I'm really excited to taste what they have put together. It's a woodsy camping experience at Page Farm with live painting, art displays, vendors, and workshops. It's art for the ears, the eyes, and the mind for three wonderful days in August. Kick back, relax, and make some incredible new friends at Wild Woods. In addition, the folks at Wild Woods offer a mission of promoting a really positive music and arts community. They have a really beautiful concept of a sustainable festival that puts caring for our mother earth above all of us and follows it up with a genuine caring for the safety and enjoyment of all attendees. That's incredible and so welcome. We all know that not all festivals have this mission. There are some that claim to and really don't follow through. We absolutely love their desire to give a really great experience to old and new friends alike. This is what life is all about. Caring for one another, and having a great time surrounded by beauty. I'm incredibly excited. I really can't wait. 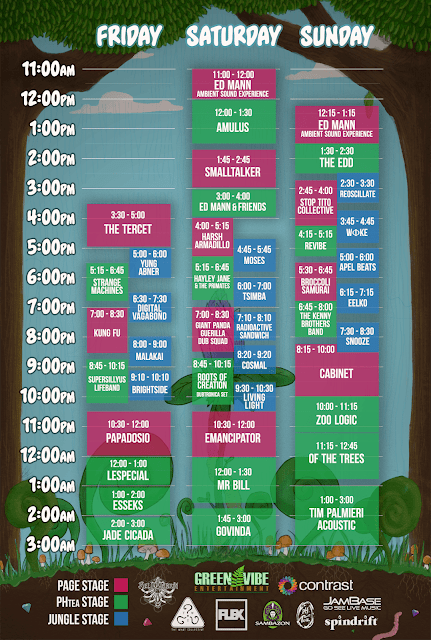 The schedule is up, and things will be kicking off Friday at 3:30pm with The Tercet, a power trio from Hampton, NH. Make sure you are in and set up so you can head over when things get started! The weekend just gets rolling nonstop from there. You can expect weekend long updates and highlights from A Perfect Mess on Instagram, Facebook, and Twitter. If you were following us during Disc Jam, you know we like to keep you updated and make you sad that you didn't go! Just kidding. We don't want you sad. That's why you should go! Tickets are still available for the weekend and you can head on over RIGHT HERE and grab yours. If you are coming, find our banner and come say hello! We would love to chat up your experience at the festival for our readers and get your take on the weekend. It's my Eric's birthday (husband, assistant, super-fly bass guy) so make sure you come by and tell him happy birthday. We are also bringing our daughter to her very first festival. She is a Kung Fu/Giant Panda super fan so look for us up front during those sets! This weekend is shaping up to be really amazing. Get your tickets and come have a beautiful GET DOWN with us!